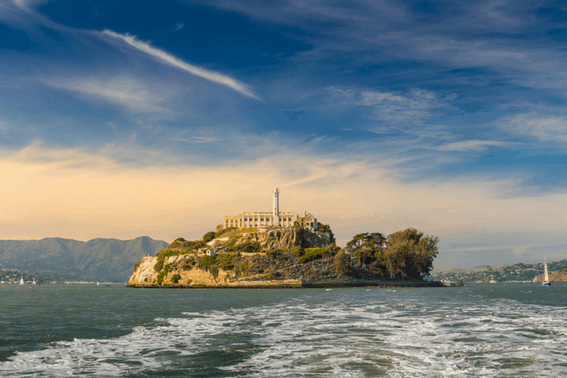 Alcatraz Island, home to the west coast’s first lighthouse, a Civil War fort, and the once infamous Federal penitentiary, was an incredible place to visit as a young adult. The island is full of unique and diverse history and is a fascinating day trip for singles and couples alike. Fast forward 15 years, a marriage, a mortgage, and three kids. 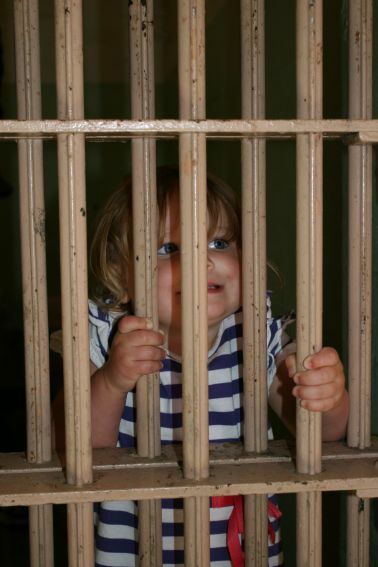 My return to Alcatraz Island was met with a bit more hesitation. Will the kids be bored? How does the boat trip work? How far out do I need to plan my trip? Are there snacks on the island? What about potty training? The list of questions seemed daunting. Thankfully, with some careful planning, my family of five (plus grandma!) 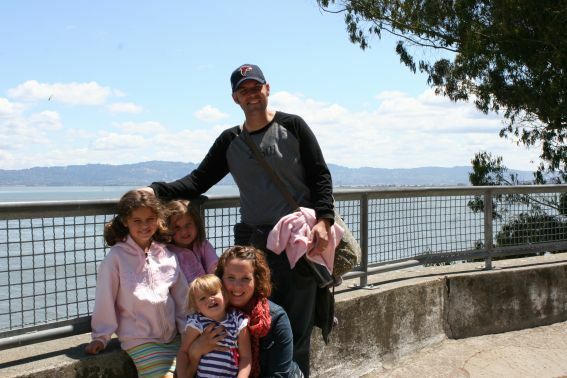 survived our family trip to Alcatraz, and you can too! Purchase your tickets well in advance as individual dates/times sell out quickly during peak seasons (summer/holidays). Take advantage of your kid’s early wake up times and select the early bird time slot. The crowds get increasingly hectic as the day progresses. Dress in layers. It can be quite windy and very chilly on the island, even in the sun; also, a fog-covered morning can quickly burn off to reveal a warm afternoon. Arrive at the pier early. The boat leaves promptly on time and doesn’t wait for straggling family members. Plan to spend at least 1-2 hours on the island covering the basics. 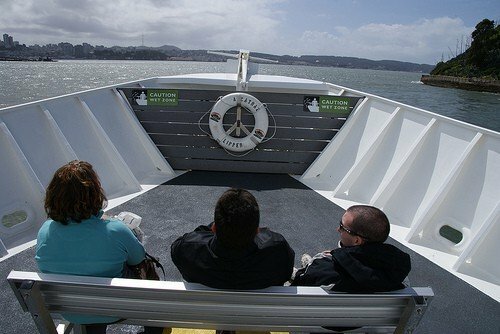 The Alcatraz Cruises takes off from Pier 33; fifteen commercial parking lots are within five blocks of Alcatraz Landing. Consider the city’s reliable public transportation system: the “F-line” Muni light rail drops you off almost directly in front of the pier. Prepare for a climb! Numerous steep switchbacks lead the way from the dock to the main buildings on the island, equivalent to climbing a 13 story building! A shuttle is provided for those with physical limitations that runs twice/hour. 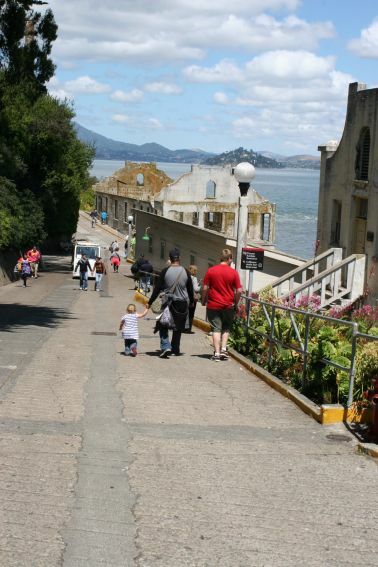 Strollers are a burden to maneuver on the island due to crowds and steep slopes. I suggest using a baby carrier for small ones. Restrooms are located on the dock and near the lighthouse. Only bottled water is allowed on Alcatraz (with the exception of the dock). Snacks and beverages are available for purchase at Alcatraz Landing (San Francisco side dock) and on board the boat. Travel Planning Tip: Although we ate breakfast before leaving our hotel, the kids were hungry (again) by the time we got to the pier. We snagged some breakfast items (yogurt parfaits, fresh fruit, and other healthy starters) at Alcatraz Landing and ate them during the short boat ride. We arrived at The Rock full of energy & ready to explore. Alcatraz Landing has a full line of food items including baked goods, coffee, and even donuts, although we chose to avoid the quickly processed sugary offerings. For the younger set, the 10-15 minute boat ride to the island might be the highlight of their trip. Although the open top-level provides fresh air and probably the best views of the bay, it can take a while to exit the boat. If your kiddos (or you!) are prone to motion sickness, the fresh air outside is a must! The boat rocks quite a bit while unloading at Alcatraz. On the top-level, it was quite difficult to not stumble over. Stay close to the bottom of the boat if you have small babies in arms. You do not have to reserve your return trip from Alcatraz. Simply arrive back at the dock and wait for the next consecutively returning boat. The Cellhouse Audio Tour is free, self-guided, and available in numerous languages. The content is not graphic or creepy, although it does detail the Battle of Alcatraz, but with no more imagery than an average TV show. Although small kids might like playing with the headphones, the content will not hold the attention of children much younger than seven. My two-year-old was finished listening about 2 minutes into the 40 minute tour. Synchronize your playback so you can hold hands with your kids while walking through the cellhouse. Especially as the day progresses, the walkways get very crowded and it is easy to lose sight of little ones. Feel free to pause your tour to talk with your kids. The content is written for adults, so your children might need some clarification to fully understand what is being communicated. Be sure to visit the mid-level exhibits, films, and gift shop that offers more information on the history of the Civil War post and Native American Indian occupation eras. Kids of all ages will enjoy taking a break from the monotony of the audio tour by stepping outside. To the south, view San Francisco’s skyline, and spot wildlife in the grassy hills. To the north, play in the yard where inmates themselves played baseball. Rows of concrete steps provide lots of area to jump and climb. Research the best rated family hotels & book your stay with Trekaroo! Disclosure: I received a complimentary media pass for the purpose of this review. I was not required to state any particular view; all opinions are my own. I am bookmarking these tips if we ever get a chance to go! I am glad that you noted to buy your ticket WAY in advance. We have tried to visit Alcatraz on two different trips and both times we were not able to get tickets a week in advance. I learned my lesson and if we plan a trip to San Francisco, these are the first tickets we will purchase!